Hi darlings! 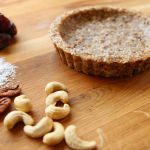 This raw pie crust can be used for practically any dessert. A delicious no bake cheese tart, lemon, mango or any creative thought that comes to mind. It only has 4 ingredients, and literally only takes 5 minutes to make. Plus, it’s gluten free and vegan! So, let’s brighten up that ordinary pie crust with a no bake, healthy and raw pie crust. Makes 2 -12 cm tarts or 1 -20 cm tart. Brush your tart pan with a small amount of melted coconut oil, so that the crust won’t stick to the pan. If you have a non-stick tart pan, then skip this step. Add the cashews, pecans, and shredded coconut, to a food processor, and blend, until fine. 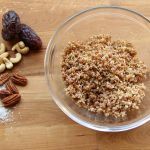 Transfer to a bowl, then add the medjool dates, pits removed, to the food processor, and blend until a paste like texture forms. Finally, add the nuts back into the food processor for a few quick pulses. 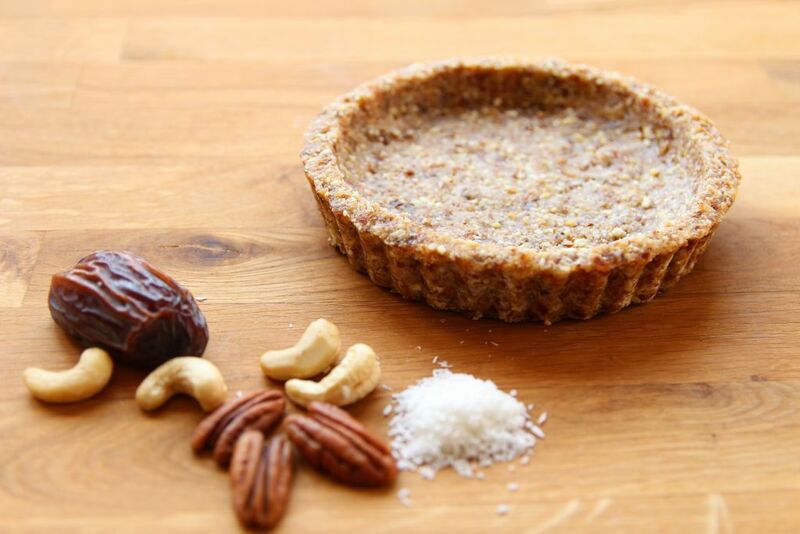 Make sure you don’t blend the mixture too long, otherwise the natural oils from the nuts will escape and leave us with an oily looking crust and taste. Now that your mixture is ready, let’s form the pie crust. Working with two thumbs, firmly press the mixture into the pan, then wrap it and store in the freezer until ready to use. Have you tried my Super Easy No Bake Chocolate Tart yet? Or how about my Super Easy Raw Vegan Blueberry Tart?